John has really wanted to make pretzels on his big green egg. Over the weekend, we didn’t have a lot of plans and decided that it would be the perfect time to give it a try. We picked out the perfect recipe, (future post) and started the dough. The dough part was my job. After the required rising time, I rolled it out as recommended and was pretty proud of forming my little works of art. John boiled the pretzels for the correct amount of time, and they were ready for the grill. And then…. And then my neighbor needed John’s help. He wasn’t gone long, but by the time he got back, the pretzels had risen again and my pretzel no longer looked like a pretzel. We cooked them up anyway. They were yummy! They were soft in the center and had that nice brown briny exterior that you look for in a pretzel. The only problem is now they looked like a pretzel bun. Well, that wasn’t really a problem at all. My niece, we call her bug but not because of any physical features, sent me a text that evening of an amazing dish for balsamic pulled pork that she had made. It really got my mind and my tastebuds working. 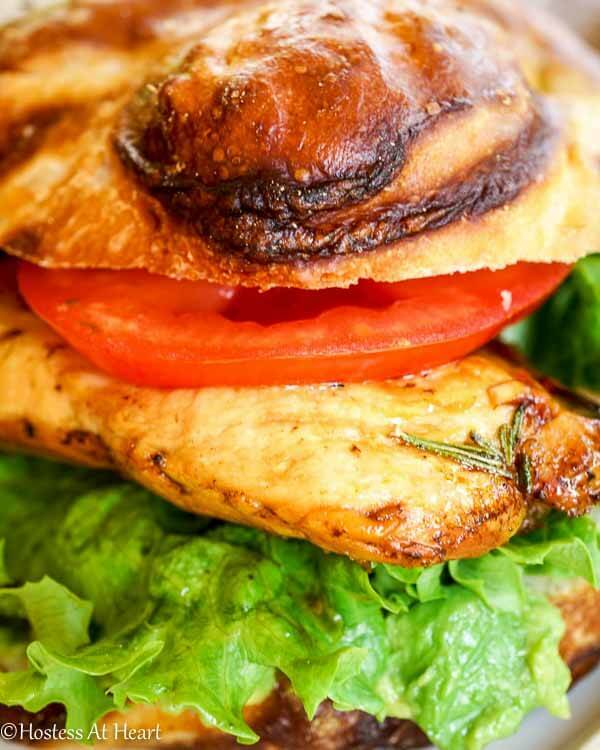 What would balsamic chicken on this pretzel bun taste like? And, what if I layered on fresh lettuce, tomato, and avocado? It made one delicious sammie my friends, and it was cooked and on the table in 30 minutes! 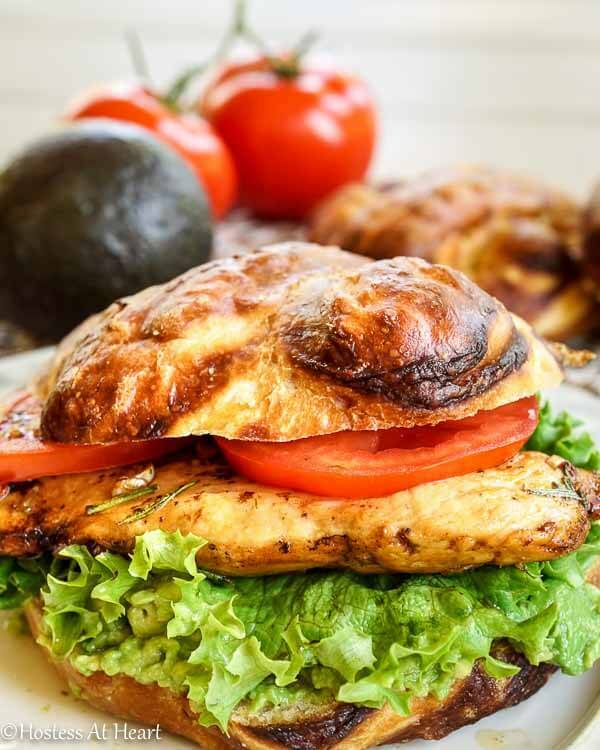 An easy, quick and healthy chicken sandwich with layers of balsamic chicken, tomatoes, lettuce, avocado, all on a pretzel bun. Spray a 9X13 plan with nonstick cooking spray. Put each chicken breast between two pieces of wax paper and pound until they are the same thickness, approximately 1/2 inch. Place chicken into prepared dish. Combine balsamic vinegar, olive oil, garlic, rosemary, brown sugar, salt and pepper. Pour over chicken. Cover with plastic wrap and refrigerate for 1 hour or overnight. Remove plastic wrap from chicken and bake uncovered in the marinade for 30 minutes or until chicken registers done. Spoon marinade over chicken after 15 minutes in the oven. Mash avocado with lime juice and a pinch of salt. Spread on both sides of the bun. Layer avocado with lettuce, chicken and tomato. Spoon balsamic juice over sandwich ingredients. Serve immediately. I mash the avocado because the other ingredients seem to slide off of sliced avocados. This recipe can also be cooked on the grill for a perfect light summer meal. Because this marinade contains brown sugar, watch that the chicken doesn’t burn. Enjoy! Now I’m taking this yummy sandwich over to Fiesta Friday. Wow! 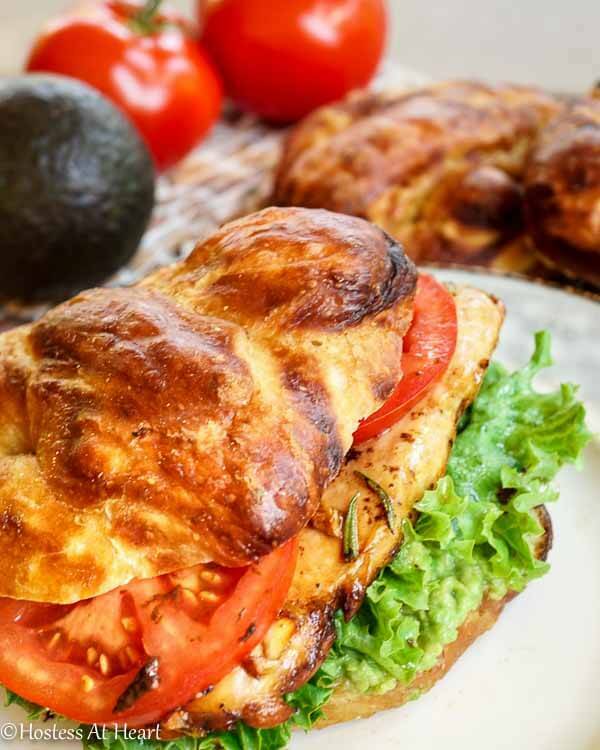 This sandwich looks incredible, that pretzel bun just makes it! Thank you Michelle! I need to make those again! That is one seriously amazing sandwich! Thank you Pam! It was yummmmm! I love it when mistakes turn into deliciousness!! These look sooo good! I know Tracy! It’s great except when you have something that is supposed to turn out and it is just crap. I had a whole week of that a while back. Arghhh. Thank you for stopping by! These look so good Julie! I love when kitchen mishap turns into something delicious! Did you also post the pretzel bun recipe? I might have missed it. Everything looks amazing! Thank you Meghan! I haven’t posted the pretzel bun. Good intentions and all of that, it’s still on my must make list! I absolutely love the idea of balsamic chicken – definitely something I have to make in my own kitchen soon. Those pretzel buns look fantastic as well. Sometimes the things that we don’t plan for end up being as good (if not better) than the original idea. Now that’s what I call a first class sandwich! all top quality & healthy ingredients, love it! I was so excited to see that you stopped by my twitter friend! This sandwich was very good and will be a repeat in my household! What a delicious-looking mistake! Yum! Thank you! It really was! That bread was so light but held together well. I will probably repeat this accident regularly! This marinade sounds so yummy, Julie! I love all of the flavors in it. 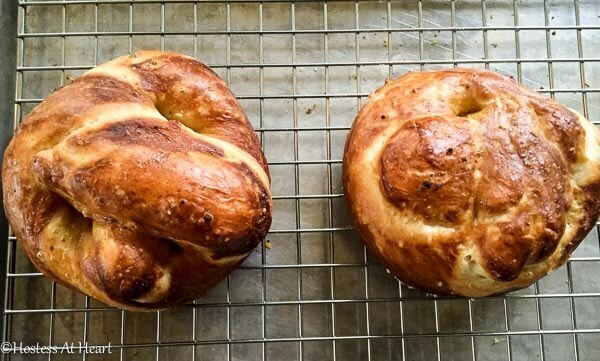 The pretzel buns look so good, too. Perfect use for them. It’s so neat that you and your husband cook together. Thank you Shari! My husband love to cook together. It is so nice because he gives me ideas of what he wants or he ill just take care of the cooking himself. I always support him with a beverage or two however. Don’t want him to get dehydrated over that grill you understand. This looks absolutely delicious! Don’t some of the best recipes come from the need to improvise? I love that you turned the pretzels into buns. I bet they’d taste amazing as burger buns too! Thank you! It was a very happy accident. My husband can do just about anything on this contraption because you can control the heat and do indirect or direct cooking. I’ve heard a lot about them and am thinking one might be a good gift for my son in law! I definitely think this might be a great gift. The women who delivered the challenge said she made them for fund raisers. They can be flavored so many ways! I was thinking of the green egg thing – my daughter and son in law just bought their first house. He does a lot of smoking (they live in Georgia) and has a great set up, but it would be nice to have just a regular grill, too. Actually, I’m needing a new grill, myself! My old one is 17 years old and pretty much giving up the ghost! I’ve heard people online just raving about these green eggs! I just don’t grill that much – especially now that the kids are pretty much gone. Then I taste something grilled at a friends (or smell the neighbors) and I’m like, ah, yes, now I remember why you grill! These grills are great but my husband is the expert. They take lump charcoal that must be started before you want to grill and then he knows what to shut down where to adjust the temp. I love grilled food, but if it was me, I would either just get a small charcoal grill or an electric grill. We replaced a very old grill too. I am hoping we get close to the same life out of tis one as we did the last one. I didn’t know that about the lump charcoal! I’m not even sure if I want to mess with charcoal of any kind! I’m leaning toward a small gas grill for me. We’ll see! Thanks for the advice! Everything about this is just PERFECT! Thank you! I loved how easy and quick it was without giving up flavor! Thank you for stopping by! hmm, simply dman delicious tangy balsamic chicken sandwich!!! Thank you! It is all of that and I appreciate your stopping by. Love the homemade bread, whether it came out as intended or not! And the sandwich sounds so delicious as well! Thank you Caroline! Sometimes things turn out in spite of us! Thank goodness! Thank you Sarah! I will be making them again! Thank you for co-hosting Judi! These bun were so good and being that they were supposed to be pretzels, only rose once. It definitely made for a yummy sandwich! Happy FF Judi! Love the idea… looks great Julie. ..
Wow, this is beautiful !!! Thank you Nicolas! This sandwich was so easy to eat. Nothing dry and I will definitely make it again! You did it yaaay Julie!! I see the change in your header :)). Great stuff! The sandwich looks ahhhhh-mazing!!! Pretzel rolls? gosh you guys are too much eh! I have a few chicken recipes with the balsamic vinegar, and they are always so tasty. Your addition of mashed avocado and lime in the pretzel roll had to have taken it to another level. Bravo! Gorgeous photography too! You are so darned sweet! I had a friend help a bit on the header. Still not perfect but I need to just concentrate on my posts for a while. This sandwich was indeed yummy! I had never made balsamic chicken before and it was easy and delicious! Thank you for stopping by Loretta. I hope you have a wonderful evening! This looks amazing! Gonna Pin this one!! Thank you Debbie! Easy, filling and light! Thank you Elaine! I enjoyed this sandwich. The site is coming along. I’m such a perfectionist that I’m always tweaking things and wish I was more knowledgeable than I am. As someone said in a comment above, your pictures are making me drool (and I just had breakfast). I love the golden-brown crust on your pretzel buns. So inviting! Lovely! Julie! Great new site! Love the updated look! I know the time and effort put into this and it looks great :). Also, is this sandwich on a croissant?? It looks ahmazing! Too good Julie!! !…I really craving for sm of it!! Julie this looks absolutely scrumptious!!! Patti!!! Thank you for stopping by! It is so easy and yummy and healthy. Perfect for those days where you would rather not sit in the kitchen. OMG! Julie these pics made me really ravenous. I need to eat something right now. You got it! I will be in bread heaven! OMG! Julie! These pics made me ravenous. Thanks sdk! Light and yummy! Thanks Amanda! I would bring you one if it would make your foot feel better! Just look at those pictures. OMG! Julie you have made me ravenous. Although it is much too early to be craving a sandwich, your gorgeous photos of this one are making me drool Julie! Awesome!